Contract Manager (CM)—The person who receives renewal notices and has full contract-related privileges within Autodesk Account. The CM also names the Software Coordinator(s)/User(s) giving them access to Autodesk Account associated with their appropriate Autodesk software(s). Note there can be only one CM on a contract. Software Coordinator (SC)—A person(s) who is named by the Contract Manager to receive email notifications to order or download applicable new releases or extensions, and to receive shipments of software. Software Coordinator(s) also can be given rights to name users to access Autodesk Account. Each serial number will have a Software Coordinator attached to it. The Software Coordinator(s) defaults to the Contract Manager unless specifically assigned. User— Any person designated by a Contract Manager and/or Software Coordinator to access Autodesk Account and the benefits associated with their appropriate Autodesk software(s). This person may also be granted download privileges for extensions and upgrades. As a User, please know that if you submit support requests, the information in your support request will be viewable by your Contract Manager, Software Coordinator, other Users in your company, and your reseller. Another tab/window called Software Coordinator Management will open with image similar to one in screen capture below. Clicking on the contract number will drill down further. NOTE: In addition to assigning/updating/removing the Software Coordinator(s) you can also use this page to edit shipping locations for your Coordinators; or name groups for your products. 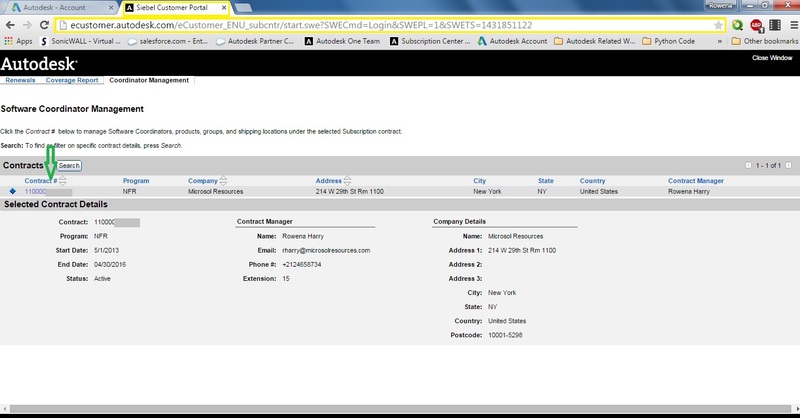 Software Coordinators tab allows you to select the Software Coordinator(s) with a shipping location you would like to edit. Software Coordinators tab also allows you to remove all association of a Software Coordinator(s). Important Note: Choose ‘Remove From All’ only when an employee has left your company or department and should no longer have access to Autodesk Account administration. Otherwise, choose cancel and instead choose ‘Unassign Software Coordinators‘ under the Products tab. Under the Products tab: Select the product(s) for which you would like to manage the assignment of Software Coordinators or rename to another group. Rename Group – Adding or editing a description that helps define a serial number. Assign – Choose or update the Software Coordinator for serial number with existing or new person. Unassign – Update existing Software Coordinator for serial number with the Contract Manager. Please note that a change of Contract Manager must be done in by us here at Microsol Resources or can be requested by current CM by opening a case within Autodesk Account. If you still have unanswered questions or are having trouble, do not hesitate to contact us! Call us at 888-768-7568 or shoot us an email info@microsolresources.com. Rowena is a Senior Subscription Specialist; she joined Microsol Resources in March of 2000. She was born in NYC and raised in Queens, NY, and currently works in the Microsol Resources Boston office, residing in Brookline, MA.